Alpha-1 antitrypsin deficiency (AATD) is a common but under-recognised genetic condition that affects approximately 1 in 2000 to 1 in 5000 individuals and predisposes to early-onset emphysema and liver disease . Alpha-1 antitrypsin (AAT) is mainly produced in the liver, and its main function is to protect the lung against proteolytic damage, especially from neutrophil elastase . To date, more than 100 variant alleles of the AAT gene (SERPINA1) have been described, but the Z allele is the most prevalent and responsible for severe AATD leading to lung and liver disease . Although great improvements have been made in the understanding of the pathophysiology of AATD in recent years, many questions remain unanswered, and the disease poses several important challenges. 1) A large proportion (∼90%) of individuals affected remain undiagnosed and therefore have no access to appropriate care and treatment. 2) Augmentation therapy is the only specific treatment for lung diseases associated with AATD and has been shown to slow down, but not stop, the progression of emphysema, as assessed by computed tomography densitometry . However, its impact on forced expiratory volume in 1 s, quality of life, exacerbations and mortality has not been definitively established. Consequently, augmentation therapy is not reimbursed in many European countries [3, 5]. 3) Although the vast majority of patients with severe deficiency share the same genetic disorder (ZZ genotype), the prevalence and severity of liver and respiratory disease vary markedly . Genetic cofactors have been suspected, but the majority have yet to be identified. 4) The natural history and prognosis of AATD patients is not well known, and there is a lack of prognostic tools to support medical decisions, for example early referral for lung transplantation . 5) Most studies on AATD have focused on the ZZ population. The impact of other genotypes, such as SZ or rare deficient variants, on outcomes is less well known [8, 9]. The answers to these questions require access to large cohorts of patients and cannot be addressed adequately even at the country level. The European Alpha-1 Research Collaboration (EARCO) is a Clinical Research Collaboration (CRC)  of the European Respiratory Society (ERS) Assembly 5 (airway diseases, asthma and chronic obstructive pulmonary disease) and aims to establish a collaborative effort that brings together multiple stakeholders, including researchers, healthcare providers, patients and industry, with the aim of advancing understanding through clinical and scientific research and improving the quality of life of patients with AATD. This pan-European initiative will enable a group of experienced and new researchers across Europe to answer fundamental questions about epidemiology, genetics, physiopathology, clinical management and prognosis of lung disease associated with AATD. The first objective of EARCO is to design and implement a prospective, international registry of patients with AATD, in order to understand the natural history of the disease and investigate the impact of different therapies, including augmentation therapy, on the course of the disease. AATD is considered a rare disease and the European Commission recommends the development of reference centres for rare diseases. These reference centres must establish a registry of their activity and collect information of the natural history of the patients prospectively . These data can be shared at national and international levels and be the foundation of registries of AATD. The development of registries is crucial, as this is the only way for successful accumulation of knowledge about the clinical characteristics, evolution, natural history and response to treatment of patients with rare diseases, such as AATD . The European Lung Foundation actively participated in the elaboration of the recent ERS statement on diagnosis and treatment of pulmonary disease in AATD . Among the most frequent issues raised by patients was the need for a global registry, more information about comorbidities, natural history of the disease and about risk factors for progression and poor prognosis of lung disease. This unmet need was shared by the authors of the statement, and one of the conclusions was that “The systematic collection of data concerning clinical characteristics and natural history of patients with AATD in national and international registries will enhance knowledge about the evolution of this disease and its optimal management” . 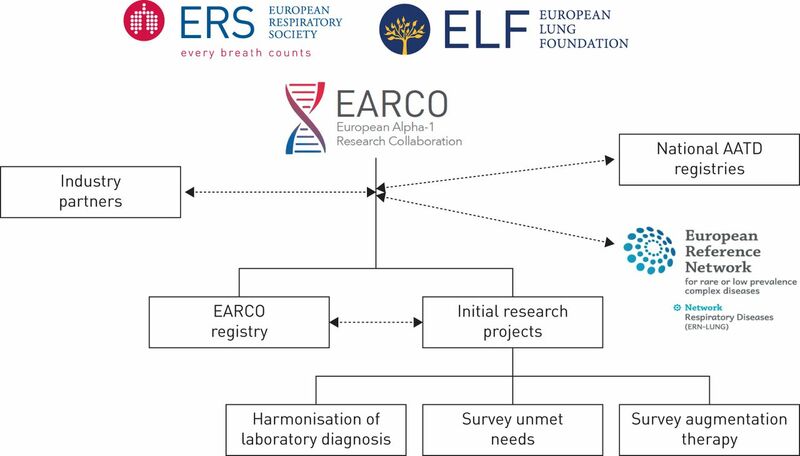 Therefore, the EARCO registry is the response to this unmet need; it will work in close collaboration with the European Reference Network (ERN) for respiratory diseases (ERN-LUNG) , the ERN for hepatological diseases (ERN RARE-LIVER) and the registry of the Alpha-1 Liver Group. In doing this, it will consider the recommendations of the European Medicines Agency about the methodology for the development of registries for regulatory purposes . The EARCO registry is modelled in part on the Alpha One International Registry (AIR) group established in 1997, which included representatives from 14 European countries . The AIR group was successful in stimulating international collaborative research and organising and developing clinical trials; however, no real-life, longitudinal data were systematically collected . The EARCO registry will also take advantage of the existing AATD registries that have been developed at the national level. Several countries have established registries in which AATD patients are included and followed up [16–22]. However, these registries differ in terms of inclusion criteria, data collected and follow-up. One of the key tasks of EARCO will be harmonising the data collection and assessing the quality of the data included prospectively. Moreover, EARCO will include all data fields that were previously used by national European registries in order to allow the future combined analysis of longitudinal data of EARCO and previous data collected by each country at a national level. In addition to the development of the registry, there are other initial objectives of EARCO for the next 3 years, as depicted in table 1. Among these objectives, it is of great importance to build a network of patients' representatives, researchers and clinical investigators, to identify informed research needs and establish an agenda for AATD research, and to attract young investigators to the area of clinical management and research of AATD for the future. In this respect, two surveys are being conducted, one for patients and the second for healthcare providers, similar to those conducted by the European Multicentre Bronchiectasis Audit and Research Collaboration (EMBARC) CRC for bronchiectasis , particularly in order to understand the key research needs in the field of AATD in Europe. Irrespective of the results of those surveys, it is clear that the EARCO registry by itself will not provide an answer to all the research questions in the field of AATD, but it can be the backbone of different research initiatives, some of which are already ongoing (table 1). Other initial projects of EARCO are the evaluation of laboratory diagnostic methods of AATD in Europe and a survey on the initiation of augmentation therapy in Europe (figure 1). The organisation of the European Alpha-1 Research Collaboration (EARCO). AATD: alpha-1 antitrypsin deficiency. Developing reliable standards for laboratory diagnosis of AATD is crucial. There are different diagnostic algorithms in different reference laboratories in Europe , which are usually adapted to the demands of the countries or to the needs of the target population for whom diagnosis is required. Although all these algorithms can provide an accurate diagnosis, it is important to establish an external quality control programme that can also be used for new laboratories, in order to ensure reliable test results . The detection of a severe ZZ deficient individual may be relatively straightforward, but rare variants and heterozygotes with intermediate serum levels of AAT may remain undiagnosed if not properly assessed. The quality control programme of laboratory diagnosis will set the standards for the correct diagnosis of the condition across Europe . Regarding augmentation therapy, the ERS statement summarised the inequalities of access to augmentation therapy in different European countries , but even in countries where augmentation is available and reimbursed there are differences in prescribing habits . Although severe emphysema at a young age is the most characteristic clinical manifestation of AATD, the clinical expression and severity of the disease is very heterogeneous  and some individuals with severe deficiency may have normal or near-normal lung function for prolonged periods of time or even for their life-time ; therefore, the decision as to when to initiate augmentation therapy is often complex. An ongoing international survey will provide insights into the current practice of augmentation therapy in those European countries where it is available. Over the next 3 years, EARCO will set up the new European-based AATD registry and establish the roadmap for clinical and translational research in the field. It will also make a substantial contribution in advocacy and education in AATD and we open a call to all ERS members to be part of that. EARCO can be contacted through the group members, the national representatives, or directly through our website (www.ersnet.org/research/earco-european-alpha-1-research-collaboration). The collaboration of all stakeholders, and in particular the inclusion of patients as active participants in the development of EARCO, makes it highly likely that EARCO will generate new knowledge with direct impact on our patients' quality of life and clinical care. We want to acknowledge the support from Elise Heuvelin and Cèline Genton (European Respiratory Society, Lausanne, Switzerland) in the logistics and organisation of EARCO. Members of the EARCO Clinical Research Collaboration are as follows. Co-chairs: Timm Greulich (Germany), Marc Miravitlles (Spain). Steering committee: Joanna Chorostowska-Wynimko (Poland), Ilaria Ferrarotti (Italy), Noel G. McElvaney (Ireland), Karen O'Hara (UK, patients' representative), Jan Stolk (the Netherlands), Robert A. Stockley and Alice Turner (both UK), Marion Wilkens (Germany, patients' representative). EARCO members: Angelo Corsico and Luciano Corda (both Italy), Maria Sucena (Portugal), Miriam Barrecheguren (Spain, ERS early career representative), Cristina Esquinas (Spain), David Parr, Beatriz Lara and Ravi Mahadeva (all UK), Jan Chlumsky (Czech Republic), Sabina Janciauskiene and Robert Bals (both Germany), Niels Seersholm (Denmark), Malcolm Kohler and Christian Clarenbach (both Switzerland), Alan Altraja (Estonia), Wim Jenssens (Belgium), Caroline Gouder (Malta), Ana Hecimovic (Croatia), Aleksandra Dudvarski (Serbia), Alvils Krams (Latvia), Ruxandra Ulmeanu and Ana Zaharie (both Romania), Jean-François Mornex (France), Arzu Yorgancioglu (Turkey), Karin Schmid-Scherzer (Austria), Hanan Tanash (Sweden) Oleksandr Mazulov (Ukraine), Yavor Ivanov (Bulgaria). Conflict of interest: M. Miravitlles reports speaker fees from AstraZeneca, Boehringer Ingelheim, Chiesi, Cipla, Menarini, Rovi, Bial, Zambon, CSL Behring, Grifols and Novartis, consulting fees from AstraZeneca, Boehringer Ingelheim, Chiesi, GlaxoSmithKline, Bial, Gebro Pharma, CSL Behring, Laboratorios Esteve, Ferrer, Mereo BioPharma, Verona Pharma, TEVA, pH Pharma, Novartis and Grifols, and research grants from GlaxoSmithKline and Grifols, all outside the submitted work. Conflict of interest: J. Chorostowska-Wynimko reports grants, personal fees and non-financial support from Grifols, AstraZeneca and CSL Behring, personal fees from Kamada, GSK, Novartis, Chiesi and Lekam, personal fees and non-financial support from Pfizer, MSD, BMS, Roche, Abbvie and CelonPharma, and grants and personal fees from Boehringer Ingelheim, all outside the submitted work. Conflict of interest: I. Ferrarotti has received speaker and consulting fees from CSL Behring and Grifols. Conflict of interest: N.G. McElvaney reports grants from Grifols (support for Irish Registry), personal fees from CSL Behring (for advisory board), and grants and personal fees from Chiesi, all outside the submitted work. Conflict of interest: K. O'Hara reports non-financial support from the ELF/ERS and from Mereo BioPharma Group plc, grants from CSL Behring (for the Alpha-1 UK Support Group, which also receives donations from individuals/companies as a result of fundraising activities), personal fees and non-financial support from NICE, and non-financial support from Alpha-1 Global, outside the submitted work. Conflict of interest: J. Stolk reports grants from CSL Behring and Kamada Ltd, personal fees from pH Pharma, and non-financial support from Mereo BioPharma, outside the submitted work; J. Stolk is also consultant to CSL Behring, Kamada Ltd and pH Pharma Inc. Conflict of interest: R.A. Stockley reports personal fees from AstraZeneca (advisory board membership and for lectures), Nycomed (for lectures), Boehringer Ingelheim and CSL Behring (advisory board membership, for lectures and travel to meetings), and from Shire, Chiesi, Polyphor, GlaxoSmithKline, Mereo BioPharma, Vertex Pharmaceuticals Inc and Akari Therapeutics plc (all for advisory board membership), outside the submitted work. Conflict of interest: A. Turner reports grants (to assess prevalence of AATD) and personal fees (for consultancy work) from CSL Behring, grants from Grifols biotherapeutics (to look at the role of CT scanning in AATD disease progression), grants from the Alpha 1 Foundation (examining phenotypes and progression after exacerbations in AATD lung disease), grants (for usual COPD) and non-financial support (to attend conferences) from AstraZeneca and Chiesi, grants from the ATS foundation (examining the role of augmentation on health status), and personal fees and non-financial support from Boehringer Ingelheim (speaker fees and support to attend conferences), all outside the submitted work. Conflict of interest: M. Wilkens reports non-financial support to reimburse travel costs from the ELF (European Lung Foundation), during the conduct of the study; as chairman of the patient organisation Alpha1 Deutschland e.V., M. Wilkens personally does not receive any donations, but the organisation receives money from public funds as well as from the pharmaceutical industry, e.g. grants as well as travelling costs. Conflict of interest: T. Greulich reports grants from CSL Behring and Grifols, during the conduct of the study; as well as personal fees for lectures and advisory boards from AstraZeneca, Berlin-Chemie, Boehringer Ingelheim, Chiesi, CSL Behring, GSK and Novartis, grants and personal fees for lectures and advisory boards from Grifols, and grants from the German Centre for Lung Research (DZL), Marburg, Germany (Deutsches Zentrum für Lungenforschung), outside the submitted work. Alpha-1 antitrypsin Pi*Z gene frequency and Pi*ZZ genotype numbers worldwide: an update. Int J Chron Obstruct Pulmon Dis 2017; 12: 561–569.
. Well-known and less well-known functions of alpha-1 antitrypsin. Its role in chronic obstructive pulmonary disease and other disease developments. Ann Am Thorac Soc 2016; 13: Suppl. 4, S280–S288. European Respiratory Society statement: diagnosis and treatment of pulmonary disease in α1-antitrypsin deficiency. Eur Respir J 2017; 50: 1700610. Intravenous augmentation treatment and lung density in severe α1 antitrypsin deficiency (RAPID): a randomised, double-blind, placebo-controlled trial. Lancet 2015; 386: 360–368. Perspectives for improving the evaluation and access of therapies for rare lung diseases in Europe. Respir Med 2012; 106: 759–768. Determinants of airflow obstruction in severe alpha-1-antitrypsin deficiency. Thorax 2007; 62: 806–813. Lung transplantation in alpha-1-antitrypsin deficiency. COPD 2016; 13: 146–152. Alpha-1 antitrypsin Null mutations and severity of emphysema. Respir Med 2008; 102: 876–884. PiSZ alpha-1 antitrypsin deficiency (AATD): pulmonary phenotype and prognosis relative to PiZZ AATD and PiMM COPD. Thorax 2015; 70: 939–945. ERS Clinical Research Collaborations: underpinning research excellence. Eur Respir J 2018; 52: 1801534. The Council of the European Union. Council recommendation of 8 June 2009 on an action in the field of rare diseases (2009/C 151/02). Official Journal of the European Union 2009; 52. Available from: https://eur-lex.europa.eu/LexUriServ/LexUriServ.do?uri=OJ:C:2009:151:0007:0010:EN:PDF Date last accessed: December 22, 2018. The Cross-Committee Task Force on Patient Registries. Discussion paper: Use of patient disease registries for regulatory purposes – methodological and operational considerations. EMA/763513/2018. European Medicines Agency, 2018. Available from: www.ema.europa.eu/en/search/search?search_api_views_fulltext=patient+disease+registries Date last accessed: December 22, 2018.
. α1-antitrypsin deficiency: a report from the 2nd meeting of the Alpha One International Registry, Rapallo (Genoa, Italy), 2001. Eur Respir J 2002; 20: 1050–1056. Ongoing research in Europe: Alpha One International Registry (AIR) objectives and development. Eur Respir J 2007; 29: 582–586.
. Antitrypsin Deficiency Assessment and Programme for Treatment (ADAPT): the United Kingdom registry. COPD 2015; 12: Suppl. 1, 63–68. Spanish registry of patients with alpha-1 antitrypsin deficiency: database evaluation and population analysis. Arch Bronconeumol 2017; 53: 13–18. The prevalence of diagnosed α1-antitrypsin deficiency and its comorbidities: results from a large population-based database. Eur Respir J 2017; 49: 1600154.
. The clinical profile of subjects included in the Swedish National Register on individuals with severe alpha 1-antitrypsin deficiency. COPD 2015; 12: Suppl. 1, 36–41.
. Survival of patients with severe alpha 1-antitrypsin deficiency with special reference to non-index cases. Thorax 1994; 49: 695–698. Italian registry of patients with alpha-1 antitrypsin deficiency: general data and quality of life evaluation. COPD 2015; 12: Suppl. 1, 52–57. The impact of smoke exposure on the clinical phenotype of alpha-1 antitrypsin deficiency in Ireland: exploiting a national registry to understand a rare disease. COPD 2015; 12: Suppl. 1, 2–9. Laboratory testing of individuals with severe α1-antitrypsin deficiency in three European centres. Eur Respir J 2010; 35: 960–968. Laboratory diagnosis of alpha1-antitrypsin deficiency. Transl Res 2007; 150: 267–274.
. Diagnosing α1-antitrypsin deficiency: how to improve the current algorithm. Eur Respir Rev 2015; 24: 52–57.
. Augmentation therapy for alpha-1 antitrypsin deficiency: towards a personalised approach. Orphanet J Rare Dis 2013; 8: 149. Clinical phenotypes of Italian and Spanish patients with α1-antitrypsin deficiency. Eur Respir J 2013; 42: 54–64. Survival in individuals with severe alpha 1-antitrypsin deficiency (PiZZ) in comparison to a general population with known smoking habits. Eur Respir J 2017; 50: 1700198.